A girl dragged off a dock in Canada by a sea lion is being treated with antibiotics because of the risk of a dangerous infection. Vancouver Aquarium said it had been contacted by the girl's family after staff had raised concerns about "seal finger", which can lead to amputations. The girl suffered a 10cm (4in) wound when the animal grabbed her with its jaws, her father told CBC News. He rejected claims that she had been trying to feed the marine mammal. 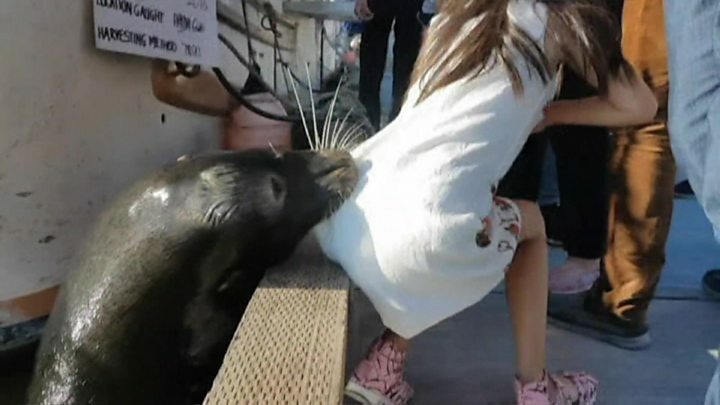 The video of her being pulled by the dress from the dockside in Richmond, British Columbia, and then rescued by her grandfather, has been widely shared on social media, prompting some users to suggest the family had been trying to feed sea lions. "There was somebody beside them that was trying to feed them," said the father, who gave only his surname, Lau, in order to prevent the identification of the girl. But he admitted his daughter had got too near when she moved forwards to have a closer look. "That's a lesson she took and she has taken that lesson in a hard way," he said. Aquarium spokesman Deana Lancaster told ABC news the family had got in touch after staff gave interviews about the risks of "seal finger" infection. Bacteria living in the mouths of seals and sea lions can cause the painful and potentially serious condition, with symptoms including cellulitis and debilitating joint inflammation. It is mainly known historically for affecting sealers' hands, although it can travel to any part of the body. Ms Lancaster said the girl was now going to get the right treatment. Mr Lau confirmed the family had been in touch with the aquarium and praised the girl's grandfather's quick response. "If he had a one- or two-second doubt about that, my girl could have been gone by then. That reaction makes him a hero," he said. He said the family had been "disturbed" by the video going viral, but were mainly just relieved the girl was safe. "Only thing I care is: God, she is safe," said Mr Lau. "I could have gone organising a funeral by now rather than doing an interview."